Mechanical Sensing Unit with Tool Holder and Tool with strain Gauges mounted on it. Dynamometer Mounting hole: 25 mm dia Hole to mount sensor on tool post. Sensor Type: Strainguage based 350Ω bridge. Connection: 9 pin D connector with shielded cable.3 meter length. 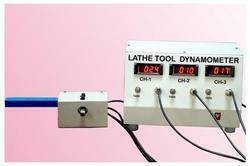 We are counted amongst the leading companies involved in offering a wide assortment of Lathe Tool Dynamometer. This product is widely appreciated for the features like excellent performance, strength and long service life. These are made by using best quality material and sophisticated technology from the manufacturers end. Tool Dynamometers is used to measure cutting forces on various machines like lathe, drill, milling machines. All the three directional forces are measured simultaneously and displayed. Tool dynamometers are useful to study, analyze optimum feed and depth of cut on different materials. 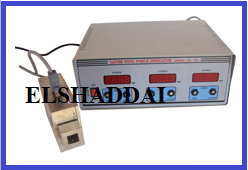 To measure cutting forces at different speed and different material. Two component of cutting forces in orthogonal cutting the axial & vertical components. The unit is with strain gauge bridge balance with power supply & digital indicator. Mounting Type: 350(L) x 350(W) x 100(H)mm to mount on the machine bed. Job Mountry: Mounting holes M10 provided to fix machine vise. - It is a Educational Aid. - It indicates that we also undertake such as educational aid related development projects.